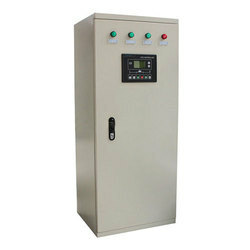 Prominent & Leading Manufacturer from New Delhi, we offer automatic transfer panel. Our company holds expertise in offering finest quality Automatic Transfer Panel to our valuable customers. Owing to their automated operations, impeccable finish, robust design and easy maintenance, these panels are highly demanded in the market. Offered panels can be customized as per the specifications provided by the customers. Machine and the electricity dual allied lock allocation, keep two roads the power (the city gives or gets an electric shock 1 give or get an electric shock with city 2 or city electricity and generator set) from throwing in the meantime load and control circuit short circuit.